I have Canon XF100 camcorder and shoot the videos recently, the Canon XF100 supports the highest HD quality with Full HD 1920×1080 resolution with Canon XF codec, up to 50Mbps bit rate and 4:2:2 color sampling. I would like to edit the recorded .mxf video on iMac with iMovie 11, which is the free and useful part of the Apple Mac iLife. While looking for solutions to import Canon XF100 MXF to iMovie 11 on iMac, I downloaded and tried several converters. Only Canon MXF Video Converter for Mac works for me. I like the batch processing and joining of multiple mxf videos into one file. The editing feature to trim the recorded videos is great, as I can control the content for conversion. For guys who may find it difficult to import and edit Canon XF100 MXF files on Mac, here is the fast guide to merge and convert Canon XF100 MXF to AIC MOV for iMovie 8/9/11. Step 1. Import Canon XF100 MXF files to Canon MXF Video Converter for Mac. Connect Canon MXF camcorder to iMac with USB 2.0 cable, run UFUSoft MXF Video Converter for Mac as the best Canon MXF to MOV converter on Mac. click the “Add” button to load .mxf videos. This Canon MXF Video Convetrer can convert Canon XF100 mxf export lossless compression video/audio compatible with iMovie 6/8/9/11 on Mac. Step 2. Choose MOV with Apple Intermediate Code AIC output format. Click the “Profile” option and choose iMovie and Final Cut Express > Apple InterMediate Codec (AIC) as output format with high quality for iMovie 6/8/9/11. 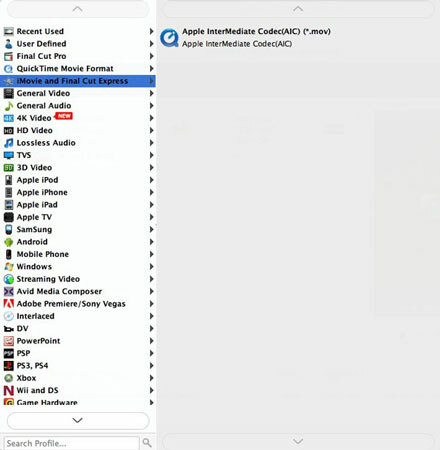 To get 1080 videos, we need to click the “Settings” button and choose 1920*1080 as output video size, Apple InterMediate Codec (AIC) as output video codec. You also can choose HD Video > H.264 HD Video(*.mov). Select the files in the filelist and click Merge, and the Mac Canon XF100 MXF Video Converter will join and combine the video clips into a single file as output. Step 5. Convert Canon XF100 MXF to AIC MOV for 8/9/11 on Mac. Click the convert button under the preview window, and the Mac Canon MXF video converter will start the conversion from Canon XF100 MXF to AIC MOV or MP4 for iMovie 8/9/11 on Mac. For some Mac users, when editing the MXF videos via the Editor windows of Canon MXF Converter for Mac, the video and sound may go output sync sometimes, making it somewhat difficult to find the trim location. But the output videos would play without sync problem after conversion.